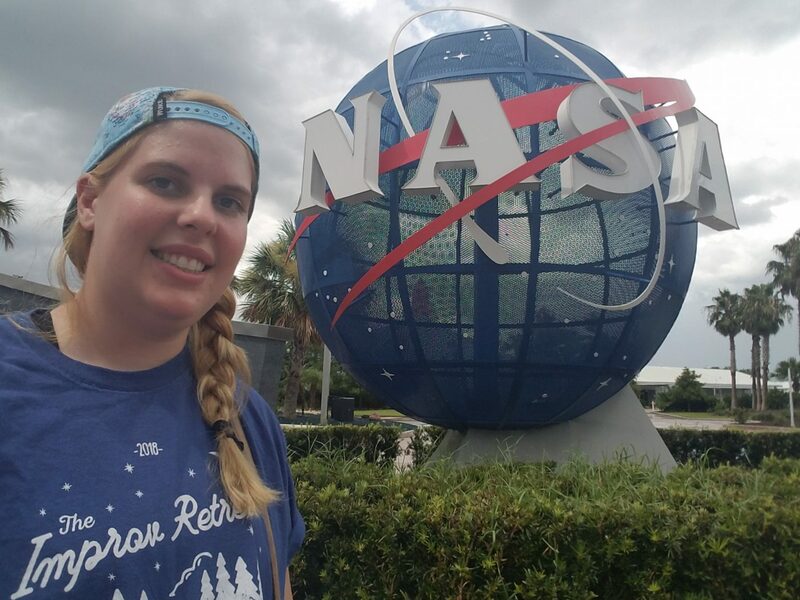 This week I went to Kennedy Space Center and a few other smaller but beautiful science centers. It was a good couple of days of exploring, and I definitely enjoyed taking it a little slower this week. Kennedy Space Center is simultaneously huge and small. There is a lot of it that is the actual base and is closed to the public except for bus tours and designated areas for launches. I did take a bus tour of the launch pads, and I really enjoyed getting to see the launch pads and also learn a lot about the different eras of the space program. The bus tour also offered a neat opportunity to see a lot of the nature preserve area that shares the land with the space center (including a look at a huge bald eagle nest that has been there since before the space program was even a thing). The bus tour ends at the Apollo-Saturn V building. There was a really cool video about the Apollo 8 launch that had the clocks and actual desks set up like they were at the time of the launch. The main KSC Visitor’s Center area had several different exhibits. My favorite exhibit at the KSC, was probably the Atlantis Shuttle area. The video of the different accomplishments of the shuttle program faded so well into the actual shuttle and it was really neat to feel almost like I was actually there for the setbacks and accomplishments that led to the actual shuttle in front of me. I also really enjoyed the launch simulator and the different skill trainers that were in the center. There was a smaller exhibit on Mars Exploration that wasn’t quite as developed as the Shuttle Area. There was also a small exhibit area on space exploration and the private sector which featured different projects being worked on by Boeing, SpaceX, and others. The last big exhibit area I went to was the Heroes and Legends hall. There was a “Hall of Fame,” which I didn’t really get the organization of. It was set up like sports hall of fames by induction class instead of by missions or time. I don’t really feel like there are that many astronauts that they all shouldn’t be recognized, and it may have been a little easier to navigate for me if they were organized by mission. There was also a big section on what makes a hero that had different aspects of astronauts’ lives outside of the space program and the characteristics they had/ have that made them good astronauts and good people. Throughout the different exhibits there were several memorial areas for the different tragedies of the space program. All of the memorials were really well done, and I was really impressed with all of them. They were beautiful and somber and really put focus on each individual life that was lost. They also all did a really good job of highlighting the lessons that were learned and the missions that were possible thanks to the sacrifices that were made. My second day of exploring this week took me to the IMAG in Fort Myers. The IMAG is a small science center with maybe 2-3 exhibit spaces and a live animal room. They had a small section on weather and a large interactive area on forces and engineering. The section that I enjoyed the most was a small section on the history of Fort Myers and the area. There were tools from natives as well as models of the first European settlements in the area. There were traditional weavings and records of different cattle brands from the 1900s. It was a really neat look at how every place has a history and if you look close enough it’s always interesting to know where we came from. My last stop this week was probably one of the top 3 most beautiful science museums I’ve ever been to. The South Florida Museum had some of the richest dioramas and exhibits. There were several displays dedicated to how different people groups lived that had really detailed environments and included plants and animals. There were also several exhibits of extinct animal skeletons that were posed in active ways and put into realistic environments which was really neat. The current animal dioramas were also artfully done. The museum also has a decently sized research collection that was on display and had a lot of pre-Columbian art from different cultures which is always neat to see. A big part of the museum is also the attached manatee aquarium. The museum participates in manatee rehabilitation and had 3 manatees when I visited. This was actually the first time since being down here that I have seen manatees due to exhibits being closed or other factors. The manatees were so graceful and slow and it was really neat to get to see them up close.